Kechiche at the 2013 Cannes Film Festival. 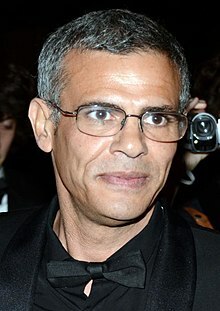 Abdellatif Kechiche (French: [abdɛlatif keʃiʃ]; Tunisian Arabic: عبد اللطيف كشيش‎, born 7 December 1960) is a Tunisian-French actor, film director and screenwriter. He made his directorial debut in 2000 with La Faute à Voltaire, which he also wrote. His film Blue Is the Warmest Colour won the Palme d'Or at the 2013 Cannes Film Festival. Born in Tunis, he moved with his parents to Nice at the age of six. He directed Games of Love and Chance, known as L'esquive, which won a César Award for Best Film and Best Director. He presented The Secret of the Grain at the 64th Mostra del Cinema in Venice for which he was awarded the Special Jury Prize. The film also received the FIPRESCI Prize, the Louis Delluc Prize and the César Awards for Best Film and Best Director. As an actor, his introduction to most English-speaking audiences was starring as Ashade the taxi driver in the 2005 psychological thriller Sorry, Haters, an "official selection" in both the Toronto International and American Film Institute's film festivals. He was decorated by the government of Zine El Abidine Ben Ali in 2005 and in 2008. His 2013 film Blue Is the Warmest Colour won the Palme d'Or and the FIPRESCI Prize at the 2013 Cannes Film Festival. Several days later a controversy erupted about Kechiche's work methods; technicians on the film accused him of harassment, unpaid overtime and violations of labour laws. The two main actresses, Léa Seydoux and Adèle Exarchopoulos, who were also awarded the Palme d'Or, had complained about Kechiche's behaviour during the shooting but later, in an extensive interview, claimed that although he was difficult to work with it had been worth it, as he was a great filmmaker. The film also won Best International Independent Film at the British Independent Film Awards in 2013. In October 2018, Kechiche was accused of sexual assault by an unnamed French actress. Kechiche is currently under investigation by the public prosecutor's office, and "categorically denies the accusations" in a statement released through his lawyer. ^ "The Secret of the Grain". Kaunas International Film Festival. Kaunas International Film Festival. Retrieved 15 July 2014. ^ Quand Abdellatif Kechiche était décoré par Ben Ali, Oumma.com, 28 May 2013. ^ "Blue is the warmest colour team win Palme d'Or at Cannes 2013". RFI. 26 May 2013. Archived from the original on 8 June 2013. Retrieved 26 May 2013. ^ Polémique autour du tournage de la «Vie d’Adèle», La Croix, 29 May 2013. ^ DP/30 @ TIFF '13: Léa Seydoux & Adèle Exarchopoulos in Blue Is The Warmest Color. YouTube (2013-09-13). Retrieved on 2014-05-22. ^ "Nominations 2013". British Independent Film Awards. Archived from the original on 5 December 2013. Retrieved 9 December 2013. Denby, David (12 January 2009). "The Current Cinema: Survivors". The New Yorker. 84 (44): 72–73. Retrieved 27 March 2009. Review of The Secret of the Grain. Wikimedia Commons has media related to Abdellatif Kechiche. This page was last edited on 24 January 2019, at 20:37 (UTC).